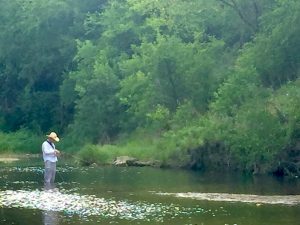 The Paluxy River is a place to go that is reasonably close to home and easy to fish. The Paluxy lived up to its billing as a mercurial bit of water — fast to rise, even faster to fall. The hope, inspired by frequent roadside warnings to use caution for high water, did not last past the morning meeting when we gathered in the parking lot of Big Rock Park. There was no water coming over the spillway, just puddles below the dam. After a filling breakfast at Debbie’s Restaurant, our grease levels were high enough to fully comprehend that we needed to go upstream. The Paluxy has a solid limestone rock bottom, and wading is easy. The water is usually clear and not overly swift. Access is easy at numerous points along its course. It is made up of the North Paluxy and the South Paluxy rivers at its confluence near Bluff Dale in Erath County. 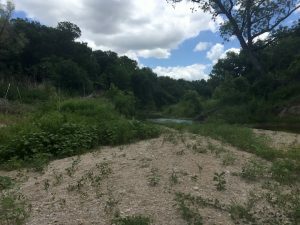 It then flows 29 miles through Somervell County to ultimately join the Brazos near Glen Rose. Over a stretch of about six miles there were numerous promising areas to explore. With 20 or so fishers, we needed a lot of space. 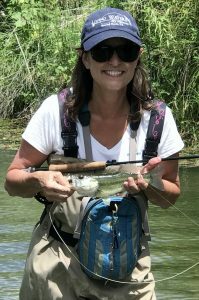 Jan Bates and friends skipped the Dinosaur State Park spots to try their luck at the first low-water crossing, then headed up to Baker’s Crossing. Jan caught a nice little bass in one of the dinosaur tracks (left). Bill Stewart led the charge at the Cemetery low-water crossing. How many times can you tell your kids or friends that you fished a cemetery? Of course, this was in the daylight. 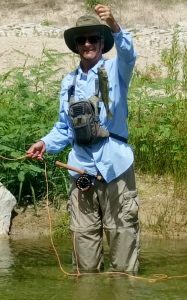 Michael Parteneau, a new member and new to fly fishing, was on his first venture with the long, skinny rod and took a bass (top right) and several bluegills. Greg Ramirez offered assistance in the effort. Congrats! Les and Kay Jackson and other Intrepid anglers went straight up to Baker’s Crossing, about five miles upstream, where Les brought in a nice largemouth (right). Other than Les’s haul, there was not much evidence of the creation of a Share-a-Lunker candidate was readily apparent. Keep your eye on the water flow reports. If it rises, plan another adventure down to Somervell County. Photos: Jeff Mitchell, left, takes a minute to look for a fly to entice a Paluxy bass, and below is a look at the approach to the Paluxy on a dry summer day. Hey I would love to learn more about your tribe! My son is going to TCU and I will be in Fort Worth Sept 28th. 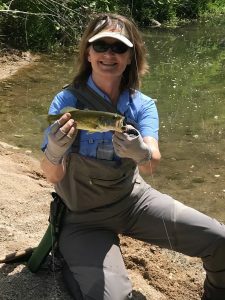 Looking for info on fly fishing the Trinity right in town. Carp, bass etc. Let me refer you to a member, Stephen Woodcock, director of fly fishing at the Fort Worth Backwoods store. The store phone number is 817-332-2423. 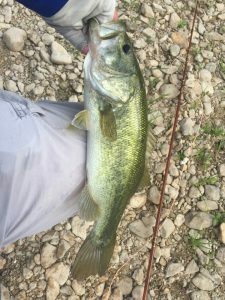 You might also post your question on our Facebook page at https://www.facebook.com/fortworthflyfishers/ and see if you get any more recommendations. On the presentation, feel free to contact our director of speakers, Adam Tate, at adamtate33@gmail.com. Good luck.